Car owners realize that keeping their car clean is important but sometimes life gets in the way. Before you know it, a car interior can get grungy. But it is amazing how simple it can be to bring a car’s interior back to prime looks. A useful all purpose cleaner is Nonsense from Chemical Guys. I have been a huge fan and user of Nonsense ever since the main guy behind Chemical Guys recommended it to me. It comes full strength and I usually get great results diluted to a 10:1 ratio. Nonsense pulls up the grime, leaves no sticky residue and doesn’t engulf the air with perfume odors. We love that it just does the job and gets great results. These seats on a 2007 Toyota Camry are a soft fabric, but the light gray coloring will attract dirt quickly. I was wondering if the dirt was ground in too much, so I did a test strip first. A simple spray of the cloth, followed by a brisk scrubbing with a hand held brush and the results showed up! A few more minutes of scrubbing and the whole car seat came back to new. I especially like the fact that the cloth maintained the original feel and shape with no soapy residue left behind. 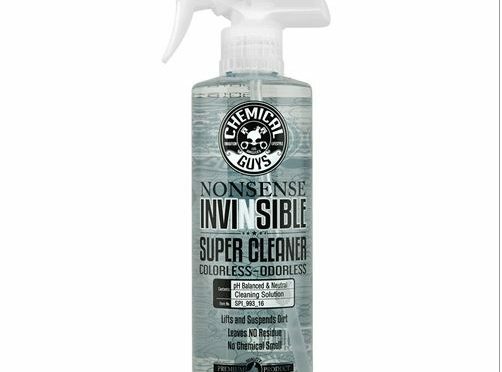 Nonsense is part of a complete set of boutique car detailing products offered by Chemical Guys. You can also get it at their franchised retail stores- Detail Garage. It works on a variety of stains and never lets me down. For a super tough stain you could amp up the dilution level but 10:1 seems to be the perfect stain removal solution for me. Try some and let us know what you think!